Home › Home and Kitchen › Heat Resistant Silicone Bbq Gloves - Best Oven Gloves - Best Grill Gloves Gr..
Heat Resistant Silicone Bbq Gloves - Best Oven Gloves - Best Grill Gloves Gr.. PURE, FOOD GRADE: Made from high quality, Food Grade Silicone. Our BBQ Gloves are heat resistant. Handle up to 425 Degrees with ease and confidence. These gloves will be essential part of your grill accessories. EASY TO CLEAN: Our gloves are dishwasher safe and easy to clean and water proof. Best Cooking Gloves you will find on market that will replace your old oven mittens. These grilling gloves are easily cleaned with warm soapy water or in dishwasher. ULTIMATE GRIP TECHNOLOGY: Designed for ultimate grip for five fingers.Sold in Pairs. Our BBQ and Oven Gloves are designed to fit most hands. NO RISK: Buy with confidence. We are confident that you will love our Silicone Gloves as much as you love any of our other products. We give you the same Risk Free, money back guarantee. If you are not happy with our Heat Resistant Gloves, we will gladly refund your money (No question asked or replace it with another one if there is an issue with your purchase). MULTIPLE USE: Use them as cooking gloves or oven gloves in your kitchen. Use them as grill gloves or BBQ gloves in your barbeque parties. Protect your hands while enjoying your occasions. You will enjoy them as the best grill accessory you ever had. Use them in your campsite, backyard, change your light bulbs. 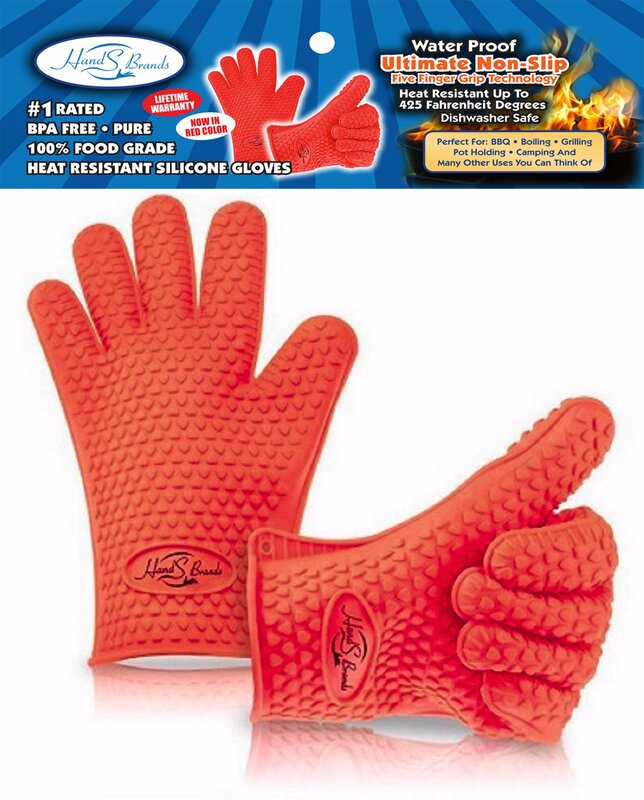 Color: Red BEST SILICONE BBQ and Oven GLOVES By HandS Brands; Brands You can always Count On Why Buy HandS Brands Heat Resistant Gloves? -At HandS Brands LLC, we always treat our customers as family. We never forget how we would like to be treated when we purchase on Amazon. -We always strive for excellence in each and every one of our products we manufacture. We listen and constantly improve. -We offer the best customer service possible. When you contact us, you will get an answer to your questions or concerns. -All of our products come with 100% satisfaction Guarantee. What this means is, we will work relentlessly until you are satisfied with your purchase. If we can't live up to your expectations, you will always get your full refund. Main Benefits of Heat Resistant BBQ and Oven Gloves -Heat Resistant, protects your hands. -Provides 10 Finger, Ultra super grip. -Handle Hot Items with Ease and confidence. -Perfect protection during BBQ (Grill), Cooking, Around Kitchen. -Non-Stick Silicone eliminates the smell you would get from your old mittens. -Our silicone gloves are well known for easy cleaning. Use warm soapy water to clean or toss them in your dishwasher. -Makes perfect gift. Lovely HandS BrandS Packaging and vibrant Orange Color will make this as a perfect gift for your special occasions. Additional Usage of Silicone Glove -Use them around the garden. -Use them on hard to open jars. -Perfect for campsites. -Change hot light bulbs with ease. -Many more that you will explore as you use our Heat Resistant Gloves. 100% LIFE TIME WARRANTY as with all of our products So buy your HandS Brands Silicone BBQ and Oven Gloves Now, so easy, use the Add to Cart Button and enjoy it once you receive your wonderful gloves.